Scientific offer wide range of function generators from 3 MHz to 10 MHz in general purpose and multifunction. Selection of waveform shapes apart from standard sine, triangle , square to ramp, pulse are available. SM5071 , SM5074 , SM5061 & SM5075 have built-in auto ranging frequency counter. The outputs are protected against short circuits and overload. These function generators exhibits , very good frequency stability over time and temperature variation. SM5074, SM5061 and SM5075 display set amplitude , in additions to other settings displayed. 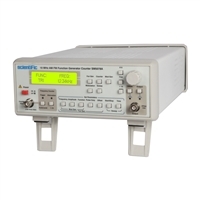 SM5061 is Programmable Function generator , which give remote control over all the parameters. This allows SM5061 to be used in ATE ( Automatic Test Equipment ) set up. Various modulation techniques can be used to learn and use in applications. All these function generators are designed , produced to give best price to performance through out their lifetime.